Why should we die where we were born? It’s almost like I could have written those words myself. And no, I didn’t. 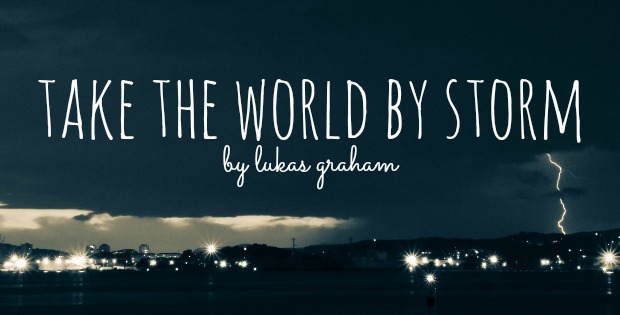 It’s just music reaching out to me again but this time through a newer (at least to me) artist, Lukas Graham. Those lyrics are from “Take the World By Storm” from his self-titled album and man, is it good! Not just the song but the album. As I did my weekly food prep yesterday I had the album on repeat, singing along to my heart’s content and just connecting with every word of this song. Deep down, I’m a wanderlust. I have a hard time staying in one place without feeling stuck and like I need to break free, to tear down those boundaries and try something new, different, and often, a little scary. When things get too stagnant or easy, I get bored and need a change. There’s a shift happening for me right now and I don’t know exactly what it is or where it’s leading me, but I know there’s more and I know I want to take the world by storm. I have never heard of this song before. I too tend to get bored easily, so having different things to look forward to is always a good thing. Also great job on the food prep. That is something I am trying to get better at. This post is everything I am feeling right now! Followed you on all forms of social media as I am excited to be inspired by your journey as I go on mine! Best wishes! Cheers to good weeks all around! I have been listening to this song so much! I feel the same way. It’s like not being able to move forward and grow. First, I’m so impressed that you do a weekly food prep, in my dreams I’m that organized! Secondly, have to check out Lukas. Always looking for new artists to add to my playlists! Good to meet you! Rosemond recently posted…The Four Simple Words We All Want to Hear. I feel the same. Whenever I’m doing the same job or the same things in the same place for a long time, I get really antsy and feel trapped! Thanks for sharing! It’s nice to know I’m not the only one..
Love this! Really resonated with me and being uncomfortable is sometimes worth the reward! I am such a creature of habit, i thrive on consistency and routine, so I admire your feelings of wanderlust, also loving his seven years song, so I need to scope this one out! Don’t get me wrong, I definitely still need routine! I’m a little envious of your way of life! I tend to become stuck in a routine and complacent with the way things are. I do thrive on routine though, so I guess that’s no surprise! I may be a wanderer but I still need routine and some sameness, for sure! I love how attuned you are to your GUT and to what you need. carla recently posted…5 Ways to Raise a Brazen Girl (or become a BRAZEN woman). Now to just get back into LISTENING to it!